Hypertensive disorders of pregnancy are important causes of morbidity and mortality. The levels of calcium (Ca2+) and magnesium (Mg2+) in pregnancy may implicate their possible role in pregnancy-induced hypertension. This study assessed serum Ca2+ and Mg2+ levels in women with PIH (pregnancy-induced hypertension) and PE (pre-eclampsia), compared to that in normal pregnancy. This case–control study was conducted on 380 pregnant women (≥20 weeks gestation) receiving antenatal care at three hospitals in the Cape Coast metropolis, Ghana. This comprised 120 women with PIH, 100 women with PE and 160 healthy, age-matched pregnant women (controls). Demographic, anthropometric, clinical and obstetric data were gathered using an interview-based questionnaire. Venous blood samples were drawn for the estimation of calcium and magnesium. Systolic blood pressure (SBP) and diastolic blood pressure (DBP) were significantly raised in women with PIH (p < 0.0001) and PE (p < 0.0001). Women with hypertensive disorders (PE and PIH) had significantly lower serum calcium and magnesium levels than those in the control group (p < 0.0001 each). Of those with PIH, SBP correlated positively with BMI (r = 0.575, p < 0.01) and Ca2+ correlated positively with Mg2+ (r = 0.494, p < 0.01). This was similar amongst the PE group for SBP and BMI as well as for Ca2+and Mg2+ but was not significant. Multivariate analysis showed that women aged ≥40 years were at a significant risk of developing PIH (OR = 2.14, p = 0.000). In this study population, serum calcium and magnesium levels are lower in PIH and PE than in normal pregnancy. Mineral supplementation during the antenatal period may influence significantly, the occurrence of hypertensive disorders in pregnancy. Hypertensive disorders of pregnancy, such as pre-eclampsia (PE) and pregnancy-induced hypertension (PIH) are a major cause of maternal morbidity . The incidence rate of pre-eclampsia stands at 3-10% globally,  with a 7% rate reported amongst Ghanaian pregnant women ,. Taking into account numerous studies conducted, the aetiology of this condition remains unknown , although factors such as obesity, diabetes, calcium (Ca2+) deficiency , advanced maternal age, oxidative stress, placental ischemia, genetics and immune maladaptation have been implicated . PIH develops due to pregnancy and regresses after delivery. It is a known cause of premature delivery, intrauterine growth restriction (IUGR), placental abruption, foetal death, and numerous adverse pregnancy outcomes. Previous history of pre-eclampsia, pre-existing diabetes, multiple pregnancies, nulliparity and advanced maternal age (≥40 years) have been reported to increase the risk of PIH and thus PE -. Previous reports have considered the association between hypertensive disorders of pregnancy (PE and PIH) and serum electrolytes, particularly Ca2+ and magnesium (Mg2+) -. It has been reported that there are reduced levels of Ca2+ and Mg2+ in pre-eclampsia ,. Meanwhile, a recent report from Nigeria has indicated that apart from raised levels of sodium in pre-eclampsia, Ca2+ and Mg2+ were within normal reference intervals . To date, a study on Ca2+ and Mg2+ levels amongst women presenting with PE and PIH is non-existent in Ghana, although the use of magnesium sulphate remains the treatment of choice, especially in eclampsia. Are there changes in levels of these electrolytes and are these changes a contributing factor to the causation of hypertensive disorders of pregnancy in Ghana? It is therefore expedient to address this gap, with the aim of providing preliminary data that could influence the prevention and management of PE and PIH in Ghana. We assessed the levels of serum Ca2+ and Mg2+ in women presenting with PE and PIH, compared to that in normal pregnancy. We further assessed factors that may contribute to an increased risk of PIH and PE in Ghana. This multicenter case-control study with consecutive sampling was conducted in the Cape Coast metropolis, Ghana, from December 2013 to May, 2014. The hospitals involved in the study included, the Cape Coast Teaching Hospital (CCTH), University of Cape Coast Hospital (UCCH) and the Cape Coast metropolitan hospital. Cape Coast covers a total land mass of 9,826 square kilometres (2223.9843 acres) with an estimated population of 1,805,488 . The study was approved by the Institutional Review Board of the University of Cape Coast (IRB-UCC) and authorities of the selected hospitals. Participation was voluntary and written informed consent was obtained from each participant. Pregnant women with gestational age 20 weeks or more were eligible participants for this study. Participants in good health, normotensive and without dipstick (reagent strip) proteinuria were enrolled as controls. Participants with elevated blood pressure (≥140/90 mmHg) with or without dipstick proteinuria (≥"+") were enrolled as cases (PE and PIH respectively). Pregnant women with chronic hypertension, on antihypertensive therapy, eclampsia, diabetes, autoimmune disease and renal disease were excluded from the study. Three hundred and eighty (380) participants (≥ 20 weeks gestation) were involved in the study. This included 160 age-matched, pregnant normotensive women, 120 pregnant women with PIH and 100 pregnant women with PE, receiving antenatal care at the selected centres. Participants with high blood pressure (≥ 140/90 mmHg) on two occasions, at least four hours apart, with visible dipstick proteinuria (≥ "+"), were categorised as PE and those without proteinuria were categorised as PIH ,. A standard interview-based questionnaire was used to obtain data on demography, clinical and family history. Height (to the nearest 0.1 cm) without shoes was measured with a wall-mounted ruler. Weight (to the nearest 0.1 kg) in light clothing was measured with a bathroom scale (Zhongshan Camry Electronic Co. Ltd, Guangdong, China). BMI was calculated using the formula; weight (kg)/height (m2). Trained personnel measured the blood pressure of participants in accordance with recommendations of the American Heart Association . Repeated measurements were taken within 5-10 minutes rest interval and the mean value was recorded as the blood pressure. Participants provided 10-20 ml of freshly voided early morning urine in clean, wide-mouthed, leak-proof containers. Urinalysis was performed using a dipstick, semi-qualitative method as per manufacturer's instructions (CYBOW™ DFI Co Ltd, Gimhae-City, Republic of Korea). Proteinuria in participants with pre-eclampsia was defined as the presence of urinary protein in concentrations ≥ "+", using the semi-quantitative colour scale on the urine reagent dipstick . After observing an overnight fast, 4 ml of venous blood sample was taken from each participant into serum separator tubes (Becton Dickinson, Rutherford, NJ). Blood samples were allowed to clot and centrifuged at 3000 rpm for 3-5 minutes within 30 minutes of sample collection. Serum Ca2+ and Mg2+ was estimated immediately, using an automated electrolyte analyser (FT-1000 Automatic Chemical analyser, Fortune company Limited, Chengdu, China). Data was entered and stored in Microsoft Excel and analysed using SPSS version 16.0 (SPSS Inc. Chicago). Categorical variables were analysed using Chi-square and Fischer's tests whilst continuous variables were analysed using the unpaired t-test. Multiple groups were compared using One-way ANOVA coupled with Dunnett multiple comparisons. Pearson's correlation and multiple logistic regression analyses were performed to determine the relationship between variables and to identify independent factors associated with hypertensive disorders (PIH and PE) respectively. In all statistical tests, a value of p <0.05 was considered significant. As shown in Table 1, there was no significant difference in maternal and gestational ages between the three groups compared. Mean blood pressure (SBP and DBP) was significantly higher in women with PIH (SBP = 155, DBP = 101; p < 0.0001) and PE (SBP = 152 DBP = 102; p < 0.0001), compared to those in the control group (SBP = 112, DBP = 65). Values are in mean ± SD and frequency (proportion) where appropriate. Comparison between proportions was done using Fischer's exact test. One-way ANOVA coupled with Dunnett multiple comparisons was used to compare multiple groups. α P-value (comparison between control & PIH); βp-value (comparison between PIH & PE); γp-value (comparison between controls & PE). PIH: Pregnancy-induced hypertension; PE: Pre-eclampsia, SBP: Systolic blood pressure; DBP: Diastolic blood pressure. Data in boldface indicate statistical significance. In Figure 1, there was a significantly lower mean serum Ca2+ and Mg2+ levels amongst pregnant women with hypertensive disorders (PE and PIH) than in the corresponding control group (p < 0.0001). There was no significant difference in the mean serum Ca2+ (p = 0.538) and Mg2+ (p = 0.211) levels between women with PIH and PE although lower in women with PE. 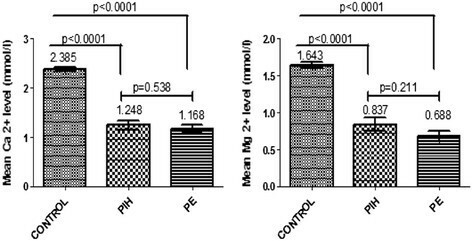 Mean Ca 2+ and Mg 2+ levels in PIH, PE and the control group. PIH: Pregnancy-induced Hypertension, PE: Pre-eclampsia, Ca2+: Calcium, Mg2+: Magnesium. P < 0.05 was considered significant for statistical comparisons using the t-test. All women with PIH and PE had hypocalcaemia (100% each). The proportion of women with PIH and PE with hypomagnesaemia was 86.7% and 100% respectively. Of the 160 pregnant women in the control group, 8 (5%) had hypocalcaemia and 24 (15%) had hypomagnesaemia. One hundred and fifty-two (152) pregnant women, representing 40%, of the total population were overweight. Of this, 64 (40%) were from the control group, 36 (30%) were women with PIH and 52 (52%) were women with PE [Table 2]. BMI = Body Mass Index, Ca2+ = Calcium, Mg2+ = Magnesium, PIH: Pregnancy-induced hypertension; PE: Pre-eclampsia. There was a significant positive correlation between the DBP and SBP (r = 0.370, p < 0.05), BMI and SBP (r = 0.434, p < 0.01) and between Ca2+and Mg2+ (r = 0.841, p < 0.01) amongst the control group (Tables 3 and 4). Of those with PIH, SBP correlated positively with BMI (r = 0.575, p < 0.01), with a similar observation between serum Ca2+and Mg2+ levels (r = 0.494, p < 0.01) (Table 3). A similar trend of positive association between SBP and BMI as well as between Ca2+and Mg2+ was observed amongst women with PE but this was not significant [Table 4]. *Correlation is significant at the 0.05 level (2-tailed). **Correlation is significant at the 0.01 level (2-tailed). GA: Gestational Age; BMI: Body Mass Index: DBP: Diastolic Blood Pressure; SBP: Systolic Blood Pressure. Data in boldface indicate statistical significance. The effect of different variables on the risk of developing PIH and PE is shown in Table 5. The only significant factor in this study that increased pregnant women's risk of PIH, as determined by multivariate analysis was age. Pregnant women aged 40 years and above were about two times more likely to develop PIH than women under 25 years of age (OR = 2.14, p = 0.000). BMI = Body Mass Index, PIH: Pregnancy-induced hypertension; PE: Pre-eclampsia. *Reference. Data in boldface indicate statistical significance. Hypertensive disorders of pregnancy are associated with increased morbidity and mortality, especially during delivery . Our study was conducted to assess the levels of serum Ca2+ and Mg2+ in pregnant women with PE and PIH compared to that in normal pregnancy. It also identified factors that may contribute to an increased risk of PIH and PE. To date, no such study has been conducted in Ghana. Our results showed that levels of serum Ca2+ and Mg2+ was significantly reduced in women with PE and PIH and advanced maternal age (≥40) was associated with a higher risk of developing PIH. The present study adds to implications on the aetiology of hypertension in pregnancy in Ghana and may influence prevention and treatment through mineral supplementation during the antenatal period. Hypertensive disorders are the commonest medical complications that develop during pregnancy, characterized by an increase in blood pressure. In accordance with presentation of the condition, the present study showed that systolic and diastolic blood pressure was significantly raised in women with PIH and PE ,. Serum calcium and magnesium are very important for metabolism at the cellular level and are vital for muscle contraction, cell death and neuronal activity , making it very essential in pregnancy. The observation of low Ca2+ and Mg2+ levels is in agreement with other studies on hypertensive disorders in pregnancy ,,,. A probable theory to this observation may be that when serum calcium levels decreased, the levels of intracellular calcium increased, leading to constriction of smooth muscles in blood vessels and therefore increased vascular resistance -, culminating in a raised systolic and diastolic blood pressure. Furthermore, previous reports suggest that altered calcium homoeostasis, as exhibited by increased calcium excretion, is associated with higher blood pressure levels . Low serum calcium levels may also increase blood pressure by stimulating parathyroid hormone and rennin release, which in turn increases intracellular calcium in smooth muscle, leading to vasoconstriction . The observation is further supported by the 2011 WHO recommendation, which found a higher risk of pre-eclampsia in pregnant women with low dietary intake of calcium and recommended supplementation for such women . This implies that calcium levels may play a role in hypertensive disorders in pregnancy. Golmohammad Lou et al. have disputed the role of calcium and trace elements in high blood pressure, for that matter, in pre-eclampsia. They explained that, although slightly lower, there was no significant difference in calcium and magnesium levels between women with pre-eclampsia and normal, healthy pregnant women . This however, is slightly contentious as magnesium supplementation during treatment of pre-eclampsia and seizures, has been shown to oppose calcium-dependent arterial constriction and may antagonize the increase in intracellular calcium concentration. A Cochrane review as well as recommendations by the WHO on prevention and management of pre-eclampsia and eclampsia have consistently supported that supplementation of these minerals in pregnancy is associated with a significant reduction in the risk of pre-eclampsia ,,. Therefore, exemptions to the fact that low calcium and magnesium levels exist in such conditions may not be justified. The observed low levels of magnesium in women with PIH and PE could be due to decreased dietary intake, increased clearance by the kidneys, haemodilution due to expansion of the extracellular space and increased consumption of minerals by the growing foetus . This together with lowered calcium levels play a role in the development of hypertensive disorders in pregnancy. Other researchers have proposed that a reduction in the level of extracellular Mg2+ causes partial membrane depolarization and decreased repolarisation along with opening of Ca2+ membrane channels, leading to an intracellular Ca2+ shift. Furthermore, the existing increase in the foetal Ca2+ demand may also block bone resorption of Ca2+ with a concurrent intracellular pull ,. This phenomenon produces vasoconstriction together with an increase in the blood pressure, as seen in PIH and PE. The effect of Mg2+ and Ca2+ in the pathogenesis of hypertensive disorders in pregnancy is supported by the observed positive correlation between magnesium and calcium in all participating groups, although not significant amongst those with PE. Further correlation analysis showed a positive association between BMI and SBP in all groups and was significant amongst both controls and those with PIH but not PE. This relationship is similar to findings from other studies -. The observed association is thought to be as a result of the role of obesity-mediated inflammation in the pathogenesis of PIH . Multivariate logistic regression showed that pregnancy in advanced maternal age (≥40 years) was associated with about a two-fold and five-fold increase in the odds of developing PIH and PE respectively. This was however significant for PIH but not PE. This observation is similar to that observed in other studies ,, but contrary to reports of existing significant risk of PE in a much younger age group (≥21 years) . Acknowledging that PIH and PE may only be different manifestations of the same disease, there is some evidence that these conditions may be distinct in pathophysiology . Furthermore, the increased risk of hypertensive disorders in pregnancy with increasing age has been suggested to be associated with the biological changes that occur with ageing . These biological changes may interact differently with the pathophysiological processes of PIH and PE, hence yielding different outcomes. In a systematic review of controlled trials , women aged ≥40 had about two times the risk of developing pre-eclampsia, whether they were primiparous or multiparous . This review however found that most studies failed to address differences between participants at baseline; hence, only one study was taken into account. Much therefore remains to be determined concerning age and hypertensive disorders in pregnancy, especially PE. That notwithstanding, caution must be exercised in assessing risk of PE in advanced maternal age. How much decline in levels of serum Mg2+ and Ca2+ is associated with an increased risk of hypertension in pregnancy? At what stage do these changes begin to manifest as a rise in blood pressure and proteinuria? Can these electrolytes exhibit a predictive ability for PIH and PE? To clarify these, it is important to conduct further studies. In this study population, levels of serum calcium and magnesium are significantly low in women with PIH and PE than in normal pregnancy. Increased maternal age was associated with an increased risk of PIH but not PE. This may suggest a cause and effect relationship between these electrolytes and hypertension in pregnancy. It helps to understand the pathophysiological process of hypertension in pregnancy, and to establish and enhance existing preventive strategies for the condition. Mineral supplementation during the antenatal period may influence significantly, the occurrence of hypertensive disorders in pregnancy. Due to limited resources, we were unable to use more sensitive and reliable quantitative methods of detecting proteinuria. Dietary patterns was not determined, thus the impact of inadequate intake of these minerals as well as the possible confounding effect of diet remains. There is limitation on the generalization of the study findings due to consecutive sampling technique used. Findings from the study however remain relevant and add to evidence on the subject matter. We thank the staff of the maternity wards and the laboratory departments of the Cape Coast Teaching Hospital (CCTH), University of Cape Coast Hospital (UCCH) and the Cape Coast metropolitan hospital for their massive support in making this work a success. RKDE, DNMO, SWD, and HE contributed to the conception of the research idea, design, data collection, data analysis and interpretation, paper drafting and revision. SWD, HE, SA and EOA, contributed to research design, patient recruitment, laboratory assays, data collection and paper drafting. All authors read and approved the final manuscript and agree to be accountable for all aspects of the work.